Peanuts building block sets available from BanBao. Snoopy’s Camper Van and Trailer shown. UPDATE! BanBao Peanuts sets are finally available online at Amazon* and Walmart*! Create new worlds for Snoopy and the Peanuts gang with BanBao building bricks! BanBao has thirty play sets to recreate the Peanuts neighborhood and Snoopy’s imaginary worlds. The World War I Flying Ace is there along with the Beaglescout leader, Snoopy the Secret Agent, the Masked Marvel and Pirate Snoopy. BanBao sent me four wonderful building sets to try out. Charlie Brown and Woodstock are join the Beaglescout leader for a camping adventure in his treehouse and camper. 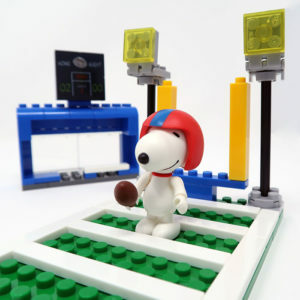 Snoopy is getting ready for football season and kicking some touch downs. It’s time for some fun at the fair with Snoopy’s balloon cart and strength tester game. At the end of the article are photos and videos to explore for an in-depth look at all the sets. Building with BanBao building bricks is easy and as fun. BanBao building bricks are comparable to other building brick toys available. Each set includes instructions, at least one ToBee figure and all the necessary bricks. I was not missing any bricks after building all four sets. I noticed with the large camper kit that the bricks were pre-sorted between the two vehicles, which makes finding the correct pieces much easier. The larger kits also have multiple packs of blocks presorted based on size. Keeping things organized with larger sets is key when building! Overall, the BanBao kits were easy to build. The only exception was the treehouse. I had problems with the tree trunk. It’s a beautiful design for a tree trunk made of blocks, but it wasn’t holding together quite right for me. Plus, I kept wanting to grab that set by the tree trunk to move it. Since I was taking videos of my building, the building surface is a little soft. Perhaps if I was using a regular table or a larger building base, I wouldn’t have such problems. With a couple extra blocks, I think I could solve the problems I was having. Come in and share some pizza! Building block sets have come a long way since I was a kid! The most interaction I’d have in my blocks were basic tires and opening doors and windows. The movement has evolved to more interesting windows and doors, much better wheels, plus ladders, bikes, steering wheels, trailer hitches and rotating handles. The kits I built included lots of fun pieces to create cups, balloons, a bed, car seats, a football, a bucket, a faucet, a slide and even a pizza box! Snoopy has all the fun stuff! I love the variety of building kits available for the Peanuts gang. The classic scenes are available such as Snoopy’s doghouse, Lucy’s doctor booth and Charlie Brown’s baseball diamond. The BanBao sets go beyond and create mini worlds for the imagination. After fighting off the Red Baron’s plane, Snoopy can get his Sopwith Camel serviced in his workshop. You’ve always known there was more to Snoopy’s doghouse. Now you can go under the scenes to his secret hideaway under his doghouse. The Peanuts gang go to school, play at the fair, and go camping. Create the worlds of Pirate Snoopy and Snoopy the secret agent with a variety of kits. At least one ToBee figurine comes with each Peanuts set. The Peanuts gang characters are brought to life with figurines called ToBees. Charlie Brown, Linus, Lucy, Sally, Franklin, Marcie and Woodstock are available in different sets. A Snoopy ToBee is included with nearly every set. Depending on the scene, hats and other accessories are included for the Snoopy ToBee for an immersive experience. The human ToBees have jointed arms, waists and heads. Their hands are posable and can hold items. The ToBees feet interlock with the bricks for a secure hold. 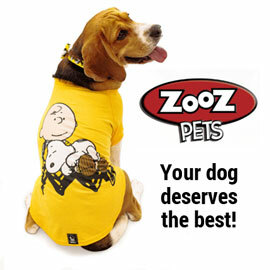 Snoopy is very similar to the human ToBees, but he has slightly different legs and body structure. The Woodstock ToBee is not posable, but can interlock with the bricks. The Peanuts BanBao building sets will be available at Cedar Fair Theme Parks in October, 2017. They will also be coming to Cracker Barrel in February, 2018. View all of the available sets in the gallery below. You can also visit BanBaoWorld.com to find your nearest BanBao shop. I will be in contact with BanBao for future updates. Be sure to subscribe to our newsletter, follow us on Facebook or subscribe on Youtube to keep up to date! Disclaimer: BanBao provided the sample for free. The review was my own opinion of the items. If you have any questions about the product or reviews, please let me, Caren, know at info@collectpeanuts.com.